Lowbrow Customs presents vintage-style braided cotton spark plug wire sets. These plug wires are cotton-braided and lacquered, but have a modern stranded copper conductor with pvc insulation for top performance. Each kit consists of a full 48" of 7mm plug wire with the rajah clips for your spark plugs installed, a pair of rubber boots and a pair of high tension terminals for the ends of the wires. Simply clip the wire to the needed length, put the boots and terminals on the end and install on your coil or magneto! Being that these are not supressor core wire, you could have radio interference with accessories on bikes that are running electronic ignitions. This was the needed addd touch to my '71 FLH and I wanted positive performance, and it gives! As always, Lowbrow has speedy service, from ordering to your door! 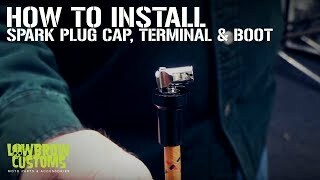 Spark Plug Wires - nice and easy! These are just as described. Super easy to strip the wires and connect the ends. The Rajah ends are especially nice and easy to get things working.